It is a general belief that trade agreements between countries and regions are beneficial for development and improving economic wealth through increased trade volumes between nations due to tariff liberalization and regulatory alignment. Nevertheless, there are some risks involved in engaging into such types of agreements, namely the risk of trade diversion which in general leads to a lower global welfare, according to theory. 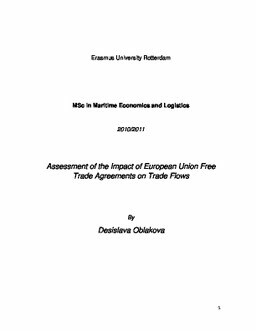 Therefore, the purpose of this thesis is to identify the effects of Free Trade Agreements (FTA) signed between the European Union and its trading partners. Furthermore, it is of our interest to identify which part exactly of trade liberalization embedded into FTAs is more influential on trade flows, tariff elimination or non tariff barriers. To answer these questions, we begin with an overview of the FTA agreements in order to indentify the tariff elimination phasing out period. The overall conclusion is that in general, tariff line for industrial exports to the EU from the partner countries are eliminated either since entry in force of the agreement or within a shorter period of time. On the other hand, European exports of industrial products are subject to a relatively longer phasing out period. Furthermore, it is important to mention, that as agricultural and food products are considered rather sensitive for the EU, custom duties elimination on these products is rather stiff. As far as NTBs is concerned, our research shows that throughout the years some NTB measures are emerging as more important and their implementation rate is higher compared to other, for instance technical measures which in 2004 accounted for 59 % of NTB measures’ distribution. The first part of the research question is answered after running the gravity model including a FTA dummy in the equation in order to quantify the impact of trade agreements on trade flows. The results of the regression analysis show that EU trade agreements have a significant impact on bilateral trade flows for partners, more precisely it leads to 0.44% more bilateral trade compared to countries with which the EU has not signed an FTA. The rest of the variables demonstrated the predicted effect from previous research carrier on the topic. The second part of the research was aimed at identifying what trade costs included in EU FTAs (tariff or non tariff barriers) have more influence on trade flows levels. In order to be able to answer the question, the FTA dummy included in the first gravity regression was substituted by two independent variables, weighted average MFN tariff rates and NTBs. In general, according to recent literature, tariff rates are diminishing progressively in the last couple of decades and the importance of non tariff measures as trade policy tools is rising. The results of the regression analysis, however, show that if MFN tariff rates increase by 1%, bilateral trade will go down by 1.07%. NTMs measure, on the other hand, had a coefficient of 0.0094, meaning that trade flows decrease by almost 0.01% if NTMs between trading partners increase by 1%. There are several explanations for these results. First, EU FTAs signed in the period chosen were not focusing on regulatory integration as much as on tariff elimination. Next, regulatory integration is a slow process, thus the benefits from NTM reductions are taking time to realize.